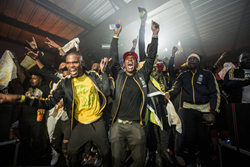 The Jamaican Crew Beat Crews Led By Mike WiLL Made-It, WondaGurl & Tinie Tempah To Claim The Title. Guests Included Jermaine Dupri, Rae Sremmurd, PushaT And Ludacris, TI & More. Atlanta, GA (August 28, 2017)—The world's biggest music battle made its debut in Atlanta on Friday, August 25. Inspired by Jamaican sound clashes, the Atlanta installment took place at 787 Windsor and featured four of the top crews from around the globe—Atlanta’s own Mike WiLL Made-It leading his EarDrummers crew, Canada’s Enjoylife led by WondaGurl, the UK’s Disturbing London led by Tinie Tempah, and Jamaica’s Unruly—which was led in spirit by Popcaan though he was unable to be at the event. The crews pulled out all the stops—from EarDrummers bringing out Pusha-T, Ludacris, Crime Mob, Fabo and Sah Babii, to Disturbing London’s “Shape of You” dubplate and special guests including Charlie Sloth, Pastor Troy and Atlantian TI crossing enemy lines and repping for the UK crew via video, to Enjoylife bringing out Rich Kidd and dropping some Drake to Unruly’s mic drop: bringing out Atlanta music royalty Jermaine Dupri—the night was filled with unforgettable surprises. After four rounds of intense competition, Unruly edged out hometown favorites EarDrummers to win the crowd’s support and proved victorious. Red Bull Culture Clash Atlanta 2017 was streamed live exclusively on Red Bull Radio. Photos for editorial use from can be found via the Red Bull Content Pool here: https://www.redbullcontentpool.com/international/AP-1SZFBVHQW1W11. The final round gave each crew a chance to play their biggest hits and call in all of their favors. Disturbing London kicked off the round with coffins and the Ying Yang Twins. Next up, Unruly’s arsenal ran deep with a Gorillaz video appearance and dubs galore, including Young MA and “Wild Thoughts” dub. Enjoylife brought out one more of Toronto’s best, Rich Kidd, and Mike WiLL and EarDrummers closed out the night with dollar bills flying and Junior Reid on the mic. After the crowd’s cheers were tallied, the winner of Round 4 and Red Bull Culture Clash Atlanta was Unruly (4 points total), making their home country proud as they victoriously carried on the Jamaican sound clash tradition. The Red Bull Music Academy is a global music institution committed to fostering creativity in music. We celebrate music, its culture, and the transformative minds behind it. Since 1998, the Academy has taken the core principles from its annual workshop for selected participants and applied this curatorial approach to events, lectures, and citywide festivals throughout the year. 20 years after the first edition in Berlin, the Red Bull Music Academy will return to the German capital in 2018. Music-makers from all over the world are invited to apply between June 15 and September 4, 2017 at apply.redbullmusicacademy.com. More than 1,500 musical luminaries have participated in past incarnations of the Red Bull Music Academy. Former lecturers include Brian Eno, Philip Glass, Erykah Badu, Ryuichi Sakamoto, D’Angelo, George Clinton, Nile Rodgers, Frankie Knuckles, Giorgio Moroder, Questlove, Steven O’Malley, Rakim, RZA, Steve Reich, M.I.A., and pioneering synth inventors Bob Moog, Tom Oberheim, Don Buchla, Roger Linn, Dave Smith, amongst many others. Plenty Academy alumni have gone on to become true figureheads of their scenes like LA soul singer Aloe Blacc; experimental electronic music producer and beat music innovator Flying Lotus; Hudson Mohawke, the Scottish producer behind the beats of Drake and Kanye West; and UK singer Katy B, who championed the sound of London’s dubstep, funky and garage. Other notable alumni include Nina Kraviz, Jamie Woon, TOKiMONSTA, Jackmaster, Andreya Triana, Axel Boman, Evian Christ, Deradoorian, Objekt, Onra, and Krystal Klear. The Red Bull Music Academy has been pairing music legends and emerging beatsmiths since 1998 in cities such as Berlin, Cape Town, Melbourne, Barcelona, Rome, São Paulo, London, Tokyo and New York City. This unique combination of old school knowledge and new school sounds is unrivalled for its creative exploration and achievement. Each Academy edition leaves behind structures to encourage musical collaboration and creative exchange for years to come. Currently there are twelve fully equipped Red Bull Studios around the world.